Yakushima, a mountainous and subtropical island off the southern coast of Kyushu known as “The Alps of the Sea,” offers some of the best hiking in Japan. Yakushima’s quiet, mossy green, primeval forests comprise a vast spread of cedars containing some of the country’s oldest living trees. 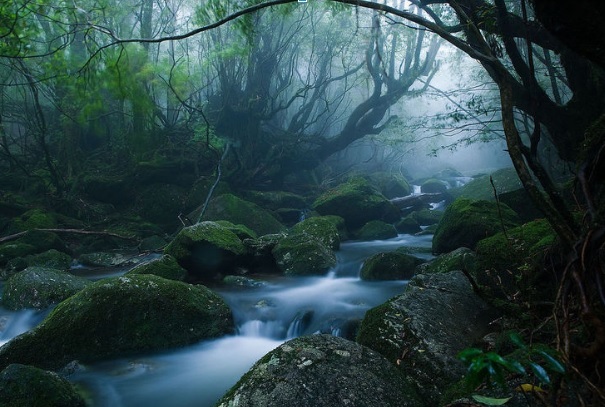 Recognized as a UNESCO World Heritage Site, Yakushima is home to almost two thousand species. Indigenous deer wander in peace while the monkeys chatter to their guests who seek out this secluded and beautiful island. If you want to spend two to three days hiking in Japan – the peculiar ecosystem of Yakushima is perfect. Trek through beautiful wooded areas filled with thousand-year-old cedar trees and broadleaf evergreens in their natural untouched environment. See how these ancient trees have attached themselves together in fascinating shapes springing from the rare mosses and ferns that grow in these forests. Microclimates make it possible to see plants from both subtropical and cold temperate zones. Abundant precipitation results in many rare plants, due to the availability of water and the changes in temperature at various altitudes. Enjoy amazing views of nearby mountain ranges, walk amongst the island’s untouched wildlife and trek through common rainfall which is an exhilarating part of hiking the wilderness of Yakushima. The island’s rich biodiversity and coastal vegetation are unmatched anywhere else in Japan so enjoy exploring the unspoiled beauty of this unique environment. Your local expert hiking guide will tailor each day to suit your hiking abilities. Spend your evenings in Yakushima at the fabulous Sankara Hotel & Spa, an auberge-style resort hotel set against the mountains looking out to the sea. 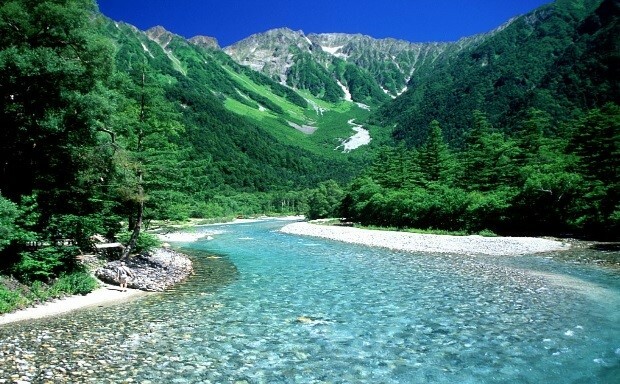 Kamikochi, a well-known resort in the Northern Japanese Alps, offers some of Japan’s most spectacular mountain scenery. A fifteen-kilometer long plateau in the Azusa River Valley, about 1500 meters above sea level, Kamikochi is encompassed by soaring mountains as well as the active volcano ‘Yakedake’. An outstanding hiking experience, trails lead through the valley and towards the summits of the neighboring mountains. Hike along the river, a mostly flat terrain requiring only a few hours of time and easy for inexperienced trekkers. Kamikochi is especially lovely during the autumn season when its foliage peaks. Breathtaking Japanese Azalea and Sagisuge flowers can be seen in the summer, and they turn white with frost coatings by late autumn. You’ll come across forests of birch and larch trees, bamboo bushes, wild monkeys and various birds during your time enjoying Kamikochi as well. Some of Kamikochi’s most scenic spots include Taisho pond, formed by the volcanic activity of Yakedake back in 1915, and Tashiro Pond which is a small pond surrounded by marshland with clear water reflecting the beautiful sky and towering mountains. Experience a walk across Kappabashi too, a wooden suspension bridge over Azusa River in the center of Kamikochi. Enjoy an unforgettable hike in Japan by traveling to Kamikochi, just 90 minutes from Tobira Onsen Myojinkan; a fabulous hot spring ryokan nestled in the forests of the Japanese Alps just outside of castle town Matsumoto, where we highly suggest a stay.